STRANRAER boss Stevie Farrell believes his side’s performances merit more than just two points from the opening three games. The Blues took a point on the opening day against Raith Rovers and followed it up with a goalless draw at Forfar last time out. Those two points have Stranraer sitting ninth in the table but the manager felt they deserved more and was looking to build on the point at Station Park when Angus neighbours Montrose visit tomorrow (Saturday). He said: “The clean sheet against Forfar was the pleasing thing. “After you get beat 5-0 in any competition, particularly midweek, you want to bounce back. “It happened with myself and Stevie Aitken a couple of times, we lost to Ayr and Forfar heavily and the following Saturday we went and picked up a good result. “We did the same on Saturday and it was important to get a good result and good performance. “We worked hard on the defensive side – we know what our Achilles heel has been in games. “But the league is our bread and butter. “We are three games in and have drawn with Raith, where we potentially should have won, last Saturday we could have won and on another day we could have taken our chances at Arbroath. “We are not that far away. “League One is unpredictable; it is the most unpredictable league every season. Perhaps the only low point from the trip to Station Park was losing Isaac Layne to injury. The frontman made his first start for the Blues since Clyde on 24 July but had to come off before the half time break against Forfar. Farrell will be missing the striker – as well as Mark Lamont – tomorrow but has added to the squad with the addition of Celtic youngster Ciaran Diver. The manager said: “Isaac’s injury is a problem – I am not going to deny it. “Working with Isaac, he is the only recognised striker at the club and I said how much we were looking forward to having him back. “After 41 minutes that ended but we have brought in a striker today in Ciaran. “We don’t want to put too much expectation on him. Saturday’s visitors come into the game after an impressive start on their return to League One. 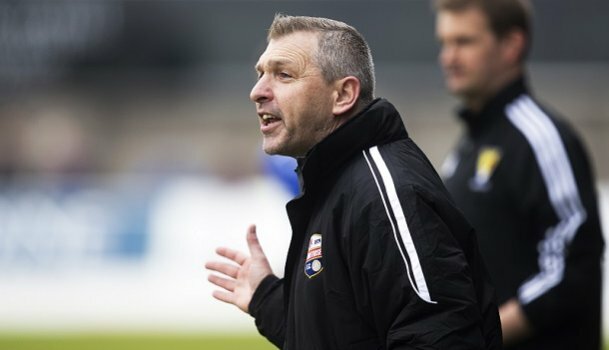 Stewart Petrie’s men came up as champions last term after edging out Peterhead and have carried that momentum forward. Farrell said: “They deservedly came up last year and I think Stewart has kept the nucleus of the squad and added one or two over the summer. “We are in for a very tough game. “They have played three games and won two. A TOPSY-TURVY game ultimately ended with Stranraer taking all three points the last time Montrose visited Stair Park. Ryan Borris hit both posts within the space of a minute and Craig Malcolm had a goal ruled out for offside. However, it would be the visitors who took the lead right on the half time whistle. Martin Boyle, now at Hibs, collected Gary Wood’s mishit shot and beat David Mitchell. Stranraer would fight back after the half time interval. Michael Moore levelled things after racing on to a through ball and beating Michael Andrews. Then, Malcolm put the Blues in front eight minutes later when he cut through the defence. Montrose were reduced to ten men when Jonathan Smart was sent off and Malcolm scored in stoppage time to wrap up the win. Stranraer: Mitchell, Taggart, Noble, MacGregor, McKeown, Aitken (Kane 84), S Winter, Stirling, Borris (Shepherd 79), Moore (McColm 74), Malcolm. Montrose: Andrews, McNally, Cameron, Campbell, Smart, Crawford, Young, J Winter (Masson 71), Boyle, Johnstone (McPhee 75), G Wood. Not used: Crighton, McGowan and S Wood. Stranraer lineup v Forfar Athletic: Currie, McDonald, Brownlie, D Smith, Hamill, Cummins, McManus, Turner, Donnelly (Ashmore 87), Anderson (I Smith 82), Layne (Elliott 41). Not used: McGowan, Lidington, Lamont and Avci. Montrose lineup v Brechin City: Fleming, Steeves, Dillon, I Campbell, Masson, Webster (Cregg 73), Watson, Callaghan, Antoniazzi (Allan 59), R Campbell (Rennie 60), Henderson. Not used: Fotheringham, Cavanagh, Johnston and Millar. EXPERIENCED referee Alan Muir makes a return to Stair Park having last taken charge of a game in Stranraer on 22 March 2014. That saw the home side up against Stenhousemuir, with the Blues leading for 86 minutes – only to take a point. Jamie Longworth scored to end an 834-minute wait for a league goal after getting on the end of Grant Gallagher’s volley across goal. However, the momentum of the game would turn during the second half when Stephen Stirling was sent off for a tackle involving Ross McMillan. Stenhousemuir came back into the contest and with 93 minutes on the clock got their leveller. David Rowson’s shot from the edge of the box was through a crowd of bodies and beat David Mitchell in goal. Mr Muir actually started that season with a match involving Montrose. Ross McCord was the goalscorer against Arbroath, with Paul Watson sent off for the victorious Montrose side. The new Stranraer FC 2018/19 home, away and 3rd kits are now available to purchase from the Club Shop at Stair Park.